The John Lewis Partnership hasn’t been fortunate enough to claim the @johnlewis twitter account, it was snapped up by another John Lewis from Blacksburg, Virginia. 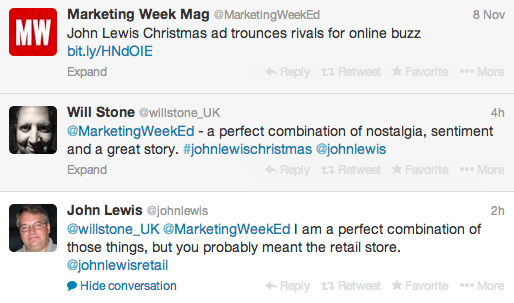 The co-operative had to settle for @johnlewisretail, but they didn’t cause a fuss, and @johnlewis has recently been given the title of “The most patient and polite man on twitter“. His politeness has been rewarded by a hamper of tech gifts from the department store. A relatively small cost for the 300K views the buzzfeed story has achieved alone. Thanks to @johnlewisretail for sending me a new macbook and lots of other goodies, with a nice letter signed by lots of folks from JL HQ.